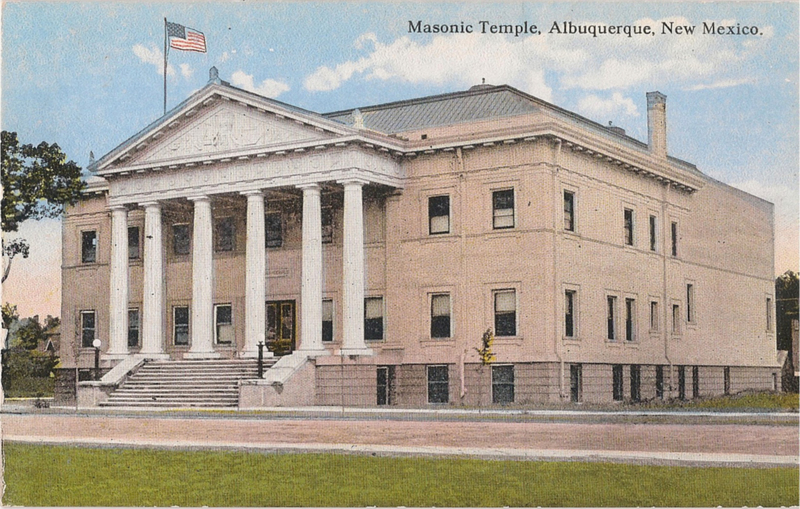 The Scottish Rite Temple in Santa Fe. Dedicated 1912, still in use today. I figured I would start off the new year with a bang and catalog some New Mexico items. It’s my home, it’s my love, and my world. And I’m always excited when I can get something “Fraternal New Mexico.” We have never been a particularly big fraternal state, I think due to factors of population flux and religious demographics. I knew that I had several postcards with fraternal subjects in New Mexico, I just didn’t really realize how many I had until I got them all together this past weekend to catalog. IOOF Hall, early 20th Century. Unknown (to me) location, probably downtown. bit debatable. It definitely hit the popular imagination in the first third of the 20th Century, when the Harvey Houses opened up a modicum of luxury for potential travelers coming across on the rails, the same rails that started to make towns into cities starting in the 1880s. The tourism was mostly ethnic in those early days, though: you came to New Mexico to see the mysterious Indians and intrude into their homes, you didn’t come for the accommodations or museums or (western) architecture. Artist colonies in the north end of the state also created a certain artist tourism industry which focused on theosophist religious experiences and otherworldly vistas. Temple 6 used to share this building at Central and 7th with the Grand Lodge, the Shrine, and the York Rite. These are a few pieces from history, though. 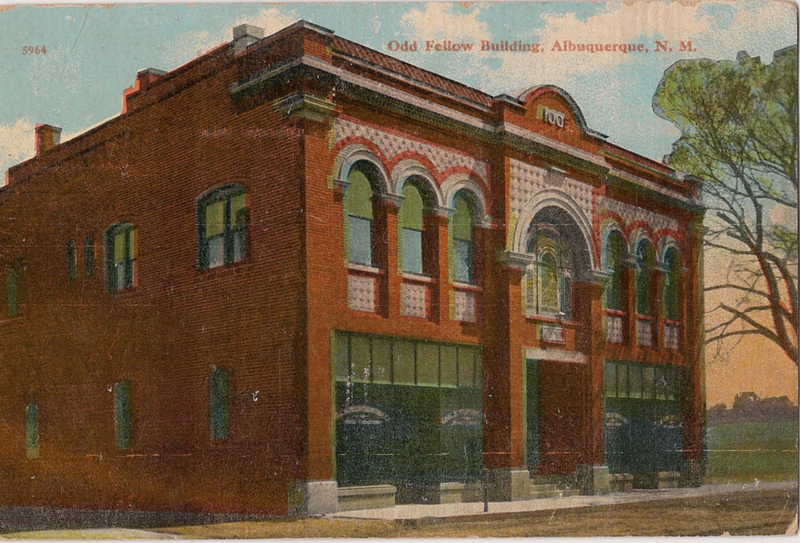 Of all of the halls shown in these postcards, ONLY the Santa Fe Scottish Rite Temple survives. All of the rest have burned or been torn down. Such a shame. The Temple Lodge No.6 building burned in April of 1967. The old Elks’ Lodge—pictured at the bottom of this post—just southeast of there on Gold Ave (once the secret society row for the city) was torn down in the 60s and a dumpy brown concrete skyscraper was built in its place. 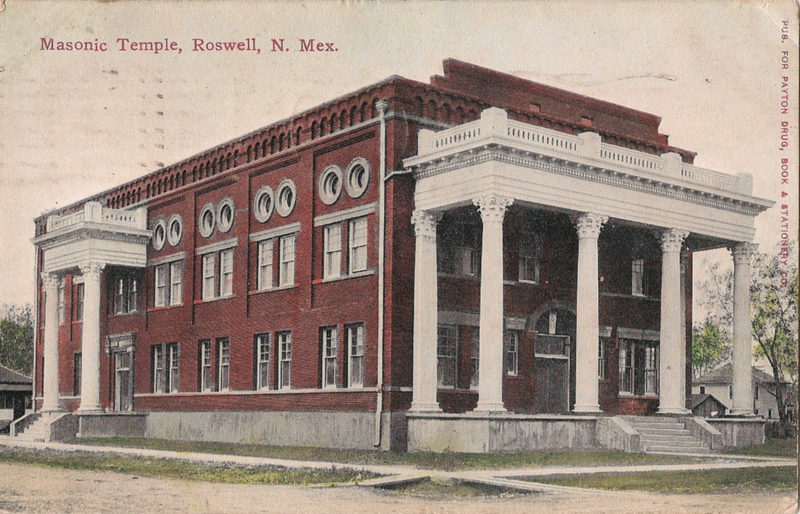 Roswell, down south, has had several pretty swanky Masonic Temples over the past 150 years, and this was probably the first major one. It looks to me like they took an existing building and added the porches to it—kind of awkward. One interesting architectural detail that I noticed, though, is that the crest that runs across the short end of the building has cut-backs suggesting the top of a keystone, one whose dimensions would be the size of the full building. Maybe my brain is grabbing at that, but it’s what I see in this view, anyhow. Romantic for York Rite Masons. Welcome to 2017, hopefully this will be the first of many posts here on PhotosAndFezzes. New Mexico’s fraternal cosmos has been modest over the centuries, but I’m proud of it. Now to help preserve more of it! The Patrons of Husbandry, more commonly called The Grange, was founded in 1867/68 by a group of eight people—seven men and one woman. The Founders were mostly clerks in various departments of the federal government in Washington, DC. Their backgrounds were generally unremarkable, some having been school teachers, a couple of them had done some farming (only one of the Founders was a “born-n-raised” farmer), one was a retired banker, and another (William Saunders) was actually a nationally known horticulturalist, most famed for designing the Gettysburg Cemetery. 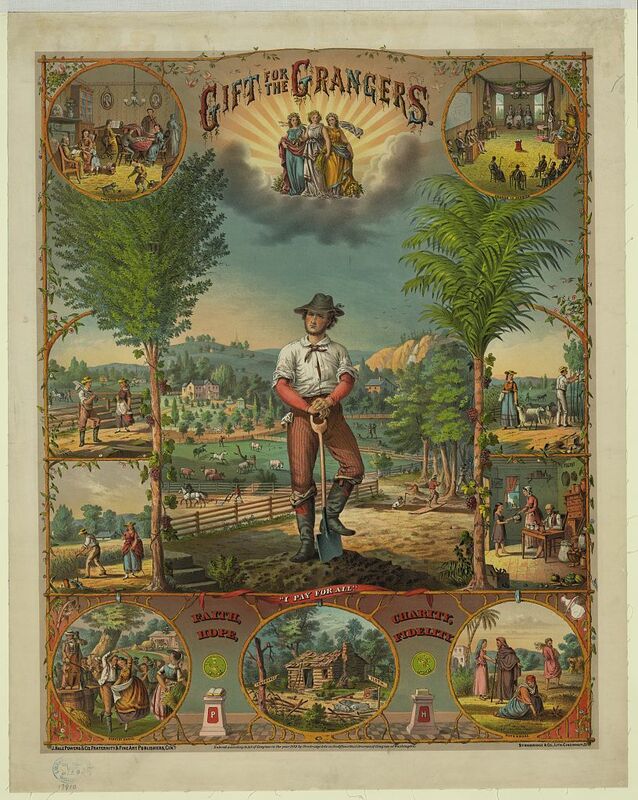 Gift for the Grangers, ca.1873, chromolithograph. Courtesy of the Library of Congress. The true Founder of the order, however, Oliver Kelly, had been tasked by President Johnson, after the close of the Civil War, to tour the South and gather data on the agricultural situation there, with a view toward putting the country back together and re-integrating the long-split economies of North and South. 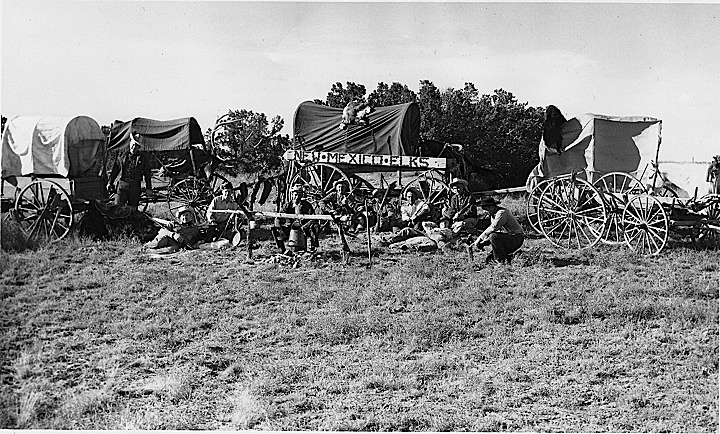 While on his mission to the South, Kelly realized that the rural populations were not just hurting from the economic disruptions of the War, their lives had been turned upside down and they badly needed an outlet to join and work together and repair their farms and their communities. The idea for the Patrons of Husbandry hatched in Kelly’s head: a fraternal organization which would be by and for the American farmer. 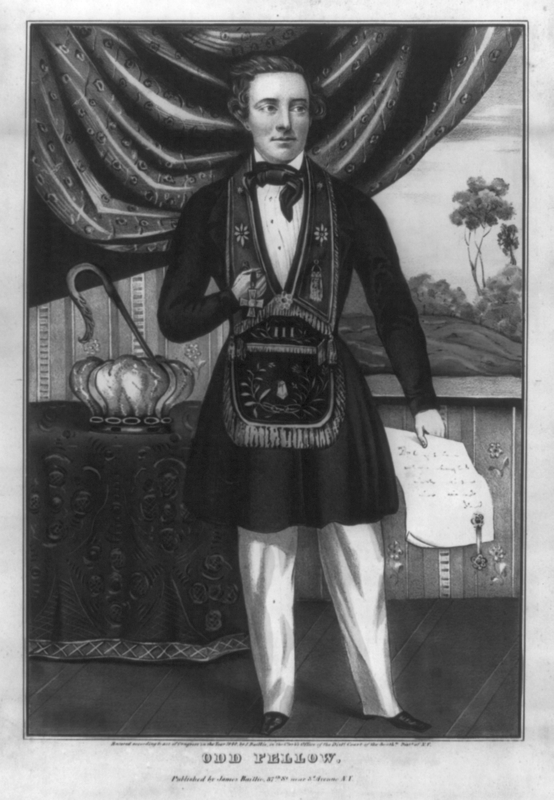 Kelly was himself a Freemason, and understood the very powerful personal connections which were possible through fraternal memberships. His core idea was to unify the farmers of America under the aegis of shared values and obligations. Very early on, as he bounced the idea off of his niece Caroline Hall, she inserted one of the most important ideas for the future organization, that the new fraternity include both men and women. Except among a very few temperance (anti-alcohol) fraternities, the integration of both men and women into one secret society was genuinely unheard of. But the inclusion of the entire family—Juvenile Granges would develop as a wing of the organization very early on—proved to be genuinely key in the absolutely wild success of the group. 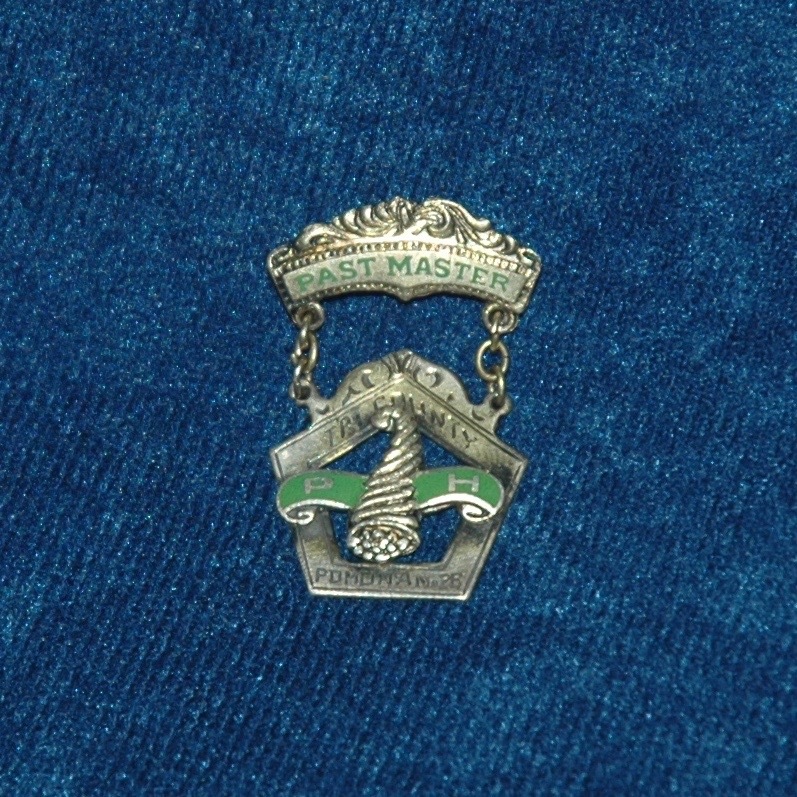 While the Grange evolved quickly to encompass a far broader-reaching program than originally envisioned by Kelly, including major national campaigns which today would be considered proto-lobying on behalf of farmer interests, the fraternal society aspect remained at the core of the organization. As with all American fraternal or secret societies, the Patrons of Husbandry employed a graduated degree system which was practiced in lodge rooms by a membership led by an officer corps. There are a total of seven degrees among the Patrons, the first four of which are conferred at the local (or “subordinate”) Grange, and the other three being conferred at the county, state, and national levels. In keeping with the inclusion of both men and women in the Grange, four of the officer positions are required to be filled by females, while the others are open to either men or women. Thus, even from the earliest days of the group, women were assured the opportunity to not only participate on equal footing, but regularly ascended the ladder to positions of leadership. 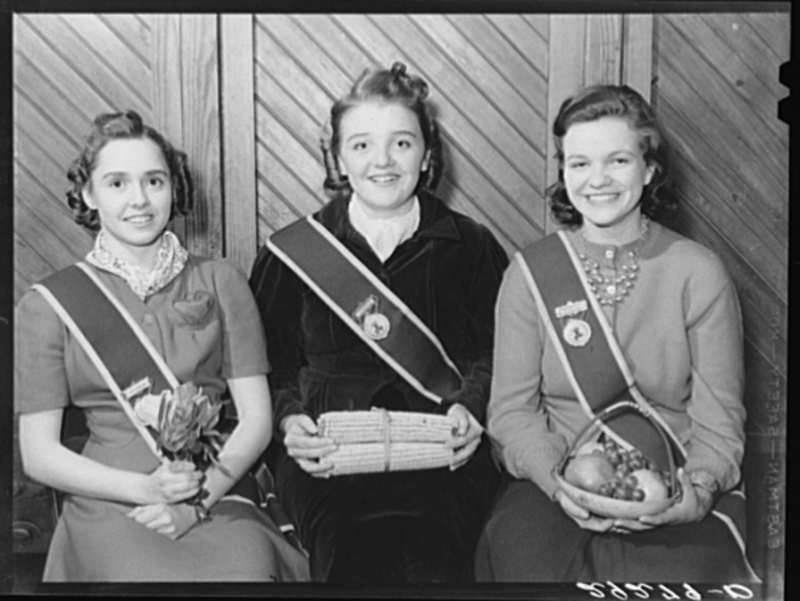 “Flora, Ceres and Pomona” by Arthur Rothstein, for the FSA/OWI, 1940. Courtesy of the Library of Congress. Oliver Kelly and others in the group of Founders were Freemasons, and another (Rev. 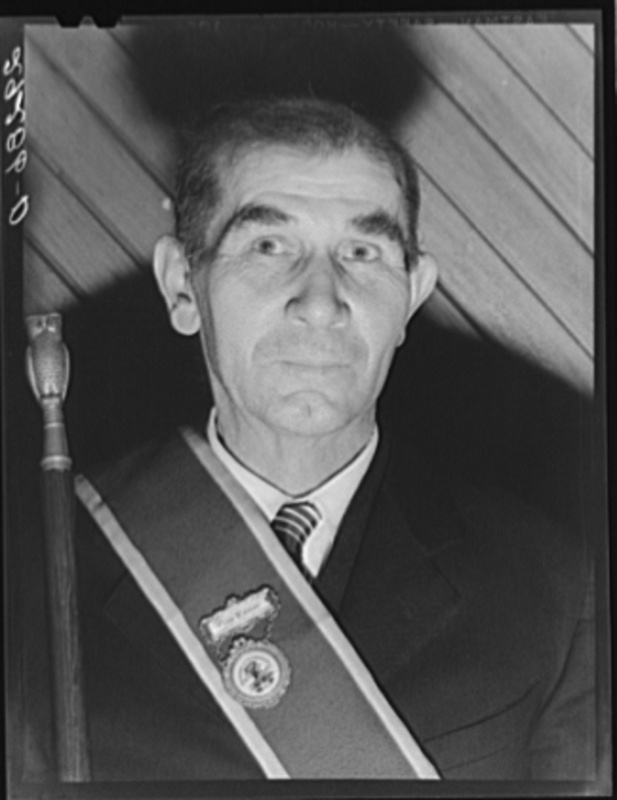 Aaron Grosh) was a nationally prominent member of the Independent Order of Odd Fellows, known for a popular book he had written about the IOOF. 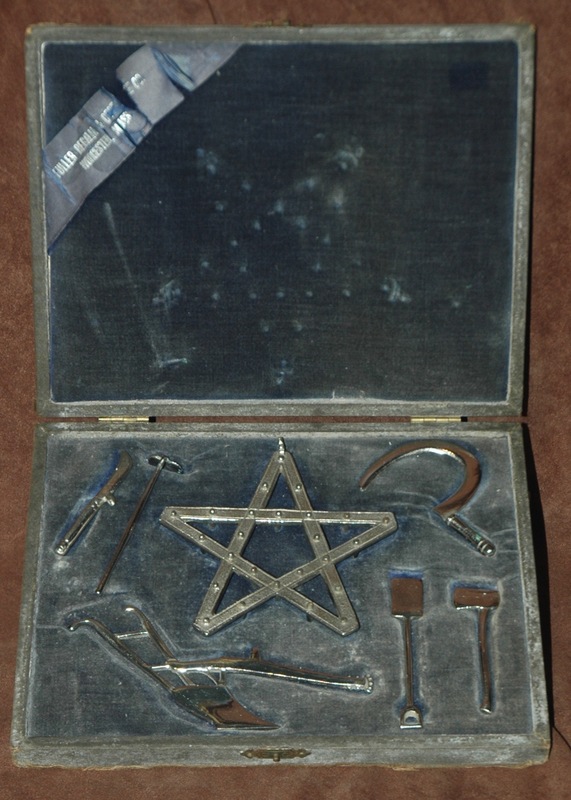 The Grange ritual and degrees certainly show some surface correspondence to the Masonic and Odd Fellows work, but were developed to have a very unique content. While the Masons take elements of architecture and tools of builders and construct metaphors based upon them for the ritual instruction of their initiates, the Grange ritual does something similar based on tools and tasks of farming. A pruning knife might be used in a literal orchard or field to take samples of growth, to shape a tree, or to excise a broken or diseased branch. But symbolically a pruning knife might suggest that a Patron carefully use the symbolic tool on himself, to examine his own growth and changes, and remember to act prudently and not over-reach in life, which could leave him later spent and troubled. Each Grange degree takes such tools, or tasks like furrowing a field or harvesting a crop, and turns them around to become metaphors of virtue and self-improvement. While there are certainly biblical allusions and quotations in Grange ritual, there are also strong nods to Classical Mythology. Indeed three of the exclusively female officer positions (and the titles of the three higher degrees) are drawn from Roman mythology. Flora is a goddess of plants and flowers; Pomona is a goddess of fruit; and Ceres is a goddess of grains. The Grange is one of the great, purely and truly American fraternal societies which arose and expanded very, very rapidly during the golden age following the Civil War. For some reason—probably because it is primarily rural, and quietly away from the centers of American power and influence (although its national HQ is in Washington, DC, near the Mall)—it is one of the least recognized and studied of the American fraternities. This is a great oversight, and a shame. The Grange is not only unique, but in the beauty of its ritual, its rich history, and its track record of directly impacting the nation, from the local community to the halls of Congress, it is one of the most important and interesting fraternities in our nation’s history. The organization is still active and working in over 30 states, and is currently gearing up to celebrate its 150th Anniversary. Its halls are still to be found all over the country, often standing strange and alone out in rural areas. Watch for them and give them a wave as you pass, or better yet get out and go knock on the door. “Gate Keeper” by Arthur Rothstein, for the FSA/OWI, 1940. Courtesy of the Library of Congress. 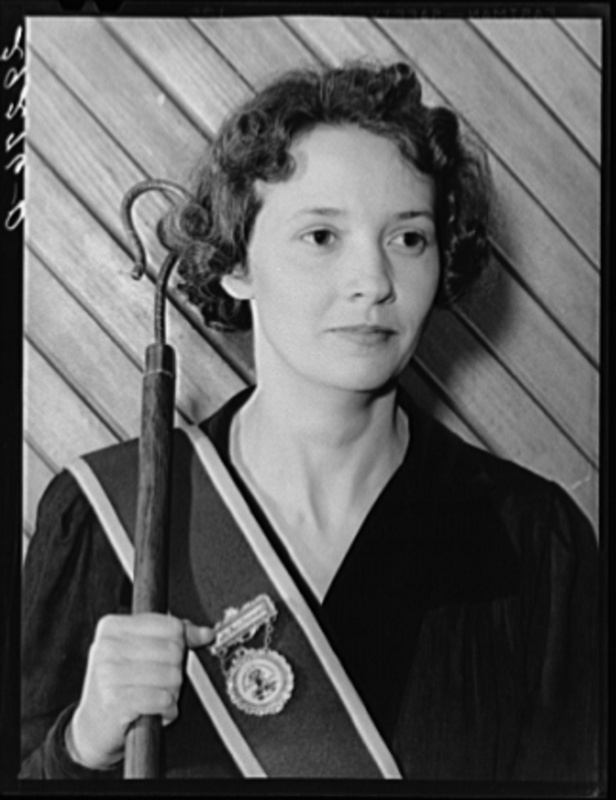 “Lady Assistant Steward” by Aurthur Rothstein, for the FSA/OWI, 1940. Courtesy of the Library of Congress. I don’t just have things for the sake of having them. For me, collecting fraternal stuff is a pleasure for the whole process of it. There is the hunt, yes. But then there is getting something home from the antique store, of receiving it in the mail, unwrapping it, looking at it, checking it for condition issues or problems, finding proper housing for it, and then photographing, measuring, cataloging, entering it in my database, and finally posting it on my Instagram or here on photosandfezzes. 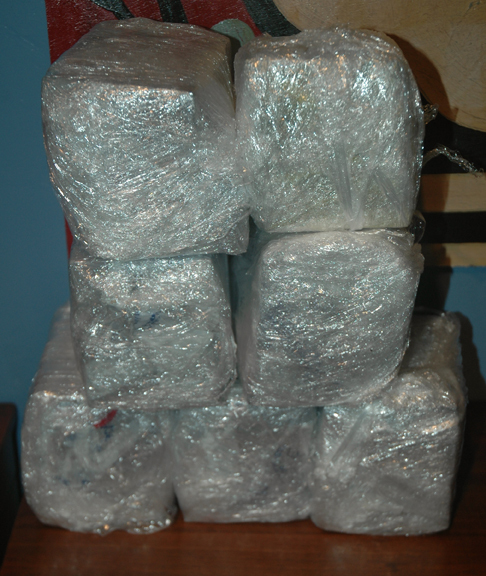 Cataloging is the part that I really enjoy, more than anything. I love really getting into a photograph or a medal, pulling out my loupe, finding what all is hiding inside the image or the object. What is there to see? Well…you never know. With photography, especially, I find that images are rarely identified in any way, so I enjoy trying to ascertain a date and determine a location. Throw me a photo of some guy in a funny hat walking past a building, and I might just be able to tell you when and where it was taken. Sometimes. Certainly not every time. This original, full photo is 3×4″, so the writing on the building is about .125″, and grainy. Take this photo of a Tall Cedars member marching in a parade. I got 13 photos in this group, all of them of these chaps in pointy hats either IN the parade, or AROUND the parade. Several of them show the parade passing this building. I got in there with my loupe and realized that the building had words on it, though I couldn’t quite make it out. I popped it onto my scanner and had it scan at extremely high res, and I got results! Click for a really big version! The Union Trust Company. I googled, got a couple possible hits, nothing very conclusive. I knew that it was probably going to be somewhere Back East: the Tall Cedars are a primarily East Coast organization (though not exclusively). And then I did a newspaper archive search, and hit gold. Images of the Union Trust Company Building published in a newspaper in Providence, RI. It’s a big building, so it was big news when it was built and opened. And it got its picture in the paper. Okay, so this was Providence. Cool, but when was it? I’m not as good at looking at clothing, necessarily, and figuring that out: that’s not in my wheelhouse. But other photos in the group had cars in the shot, and I was again able to look close at those. And again, Google is my friend. I also don’t know anything about cars, but it’s easier to look at cars and identify them, than dresses or hats. I looked up something silly like “old cars” and scanned the the images, and surfed it out from there. Of course, there were lots of cars to sift through. So I pulled the old archaeologist trick: it can’t be any OLDER than the YOUNGEST thing that you can see. There could be Model-T’s as far as the eye can see, but if there’s a DeLorean, then it has to be from the 1970s or after. Assuming no time travel took place. Sitting at the curb behind this guy is what looks like could be a Ford Model A, which was in production 1927-1931. That’s the latest model car I see in these photos, so I give the photos a date of ca. 1930. 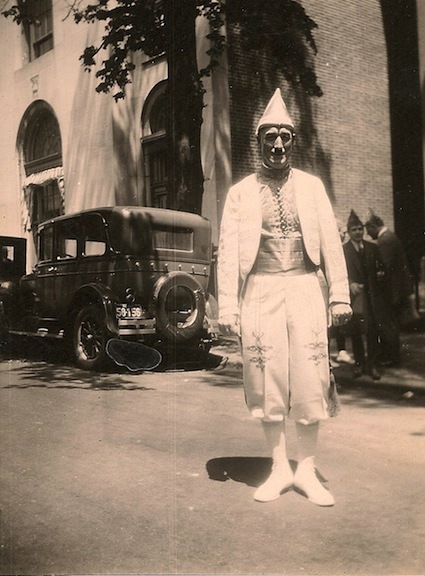 A little research and time moves these 13 photographs from being a handful of great images of the Tall Cedars marching, to being able to say that Tall Cedars of Lebanon were marching in a massive parade which took place in Providence, RI around 1930. To me, that’s excellent, and that’s what I enjoy about collecting. It’s been a while (*cough*threeyears*cough*) since I’ve done much with this site, but now I am jumping back in and getting it going again. The biggest change is that I am reformatting the catalog entries, so that there won’t be an individual page for each object. Rather, there will be larger pages that contain multiple entries for each category. This means that old entries/pages that people have visited (dare I say “bookmarked?”) won’t be there any more, but nearly all of the same objects will be viewable under the same broader headings. Also, comments left on individual entries will unfortunately be lost. Apologies to the authors. The menus still work like they used to, but they won’t break out all the way down to particular objects. Easier, and much more tablet friendly, in my opinion. Everybody knows that the Masons wear aprons. Well…everybody that knows about fraternal matters knows that. 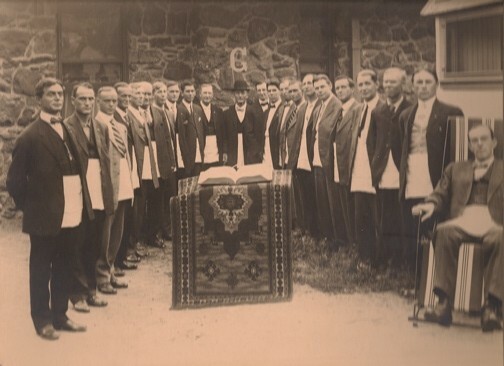 But not many people realize that a a wide array of fraternal organizations, both in the US and abroad, have worn aprons as part of their ritual garb. Free Gardeners in long aprons. It’s a common mistake of Freemasons to just assume that, “they copied that from us.” The facts may be quite different. Going back, we can trace other equally old groups in the UK and Ireland that have worn aprons for an extremely long time. The Order of Free Gardeners, for instance, which is identifiable coevally with the pre-Grand Lodge Masons in Scotland (late 17th C), wore aprons. 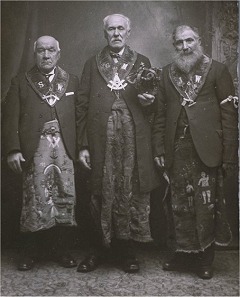 The style of their aprons was longer than the typical styles found in Freemasonry. When you spend your day kneeling in a garden, you need something that falls below the knee! And it makes complete sense that there would be other orders with aprons or apron-like garments. We can trace a number of to-be fraternal orders out of the misty meeting places of early trade unions and incorporations (as they were known in Scotland). These orders will have brought with them for the ride, the emblems of the earlier trade that inform the ritual of the later order. That will include aprons in a number of contexts, I imagine. In some cases, however, there does seem to be a very purposeful copying of Masonic emblems and styles in the use of the apron. One notable example is with the Ancient and Illustrious Order Knights of Malta, whose apron can be seen here in my collection. The AIOK of M were, as their name implies, a “knighthood” fraternity, styling themselves somewhat loosely after one of the several organizations that emerge from the Middle Ages and the Protestant Reformation who use the same terms for themselves. The original Sovereign Military Order of Malta was a successor order to the Hospitallers, who themselves soaked up the men and money of the crushed Templars. The AIOK of M probably tie themselves to the Order of St. John—Protestant schismatics from the original Papal Military Order—as the AIOK of M were a notably anti-Catholic organization. (cf. private correspondence with S. Anthony, November 2012.) Their regalia is almost indistinguishable from the Knights Templar of the York Rite. The most glaring difference between the two is that AIOK of M wore rectangular aprons, and KTs wore triangular aprons (when they did, these days they don’t wear aprons at all). Otherwise, the black late 18th C. military uniforms with silver decorations, chapeaus, the Maltese cross emblem, the red cross emblem, the skull and crossbones, and even their motto, “In Hoc Signo Vinces”, are nearly identical. 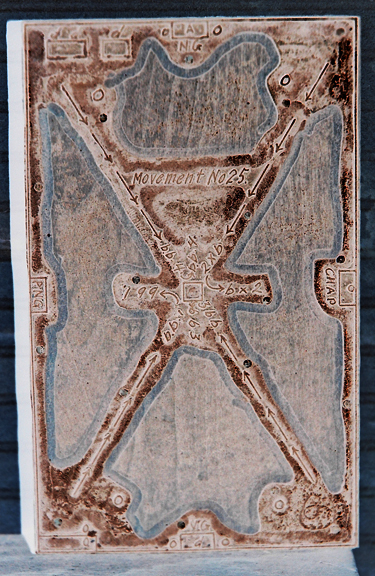 The best way to tell an AIOK of M item from at KT item is that the AIO places eagles between the arms of their Maltese cross, whereas the KTs don’t. An Odd Fellow in Apron. Additionally, the Odd Fellows also wore aprons for a very long time, although they don’t any more. It is recorded in the Complete Manual of Oddfellowship that at least as early as 1797 the Oddfellows utilized aprons, which were given to relieve the nakedness of an initiate, and were meant to recount and symbolize the covering of their own naked bodies by Adam and Eve in the garden. Oddfellows aprons are very widely varied in type, shape, format, and decoration. When they have a flap on the front, it is almost always a rounded flap, or even a double-lobed flap, rather imitating a hanging garland in its form. Sometimes they have no flap at all. 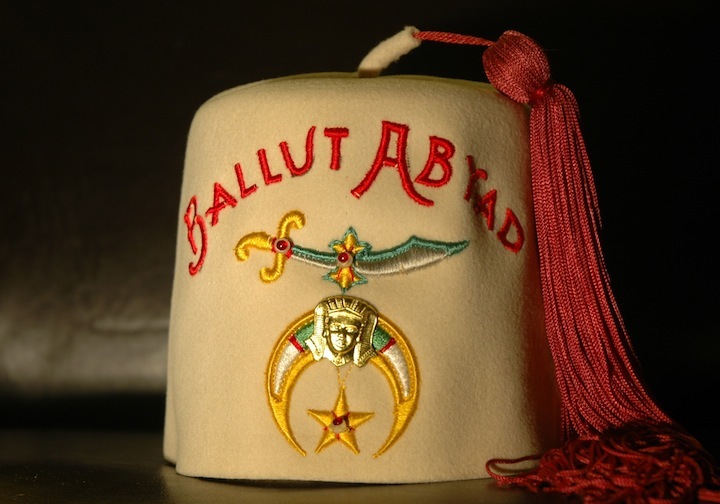 They have tended to be extremely colorful, and perhaps more composed in a heraldic sense overall than their older Masonic counterparts (which have a tendency toward a scattershot of emblems reminiscent of tracing boards). 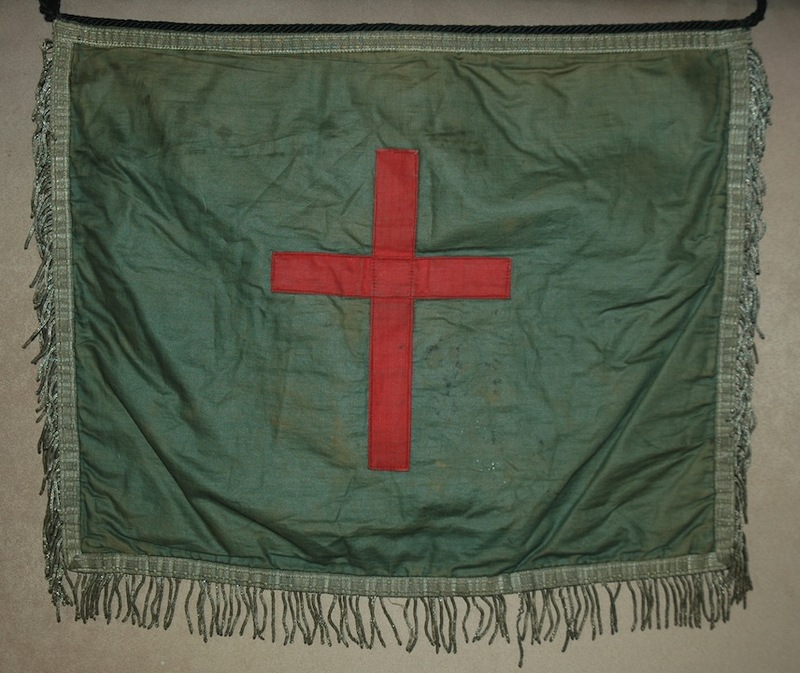 Cloth applique is not uncommon, often with borders of colorful or tartan cloth added as framing devices. It was very common on Oddfellow aprons to print the leather with an engraving plate, and then add hand coloring and other elaborations. Reports of such elaborate finery holds up and makes good sense considering that early reports of Oddfellow parades, going back to the early days of the order, when it can be distinguished and discovered in the late 18th and early 19th Centuries, mention the group as having a particular penchant for a florid excess of color and decoration. (cf. Victoria Solt Denis, Discovering Friendly and Fraternal Societies. pp.90,91) In what year the Oddfellows stopped wearing aprons—perhaps due to a change in the ritual that referenced them?—I am not certain. Images from just past the turn of the 20th Century show the apron disappearing. 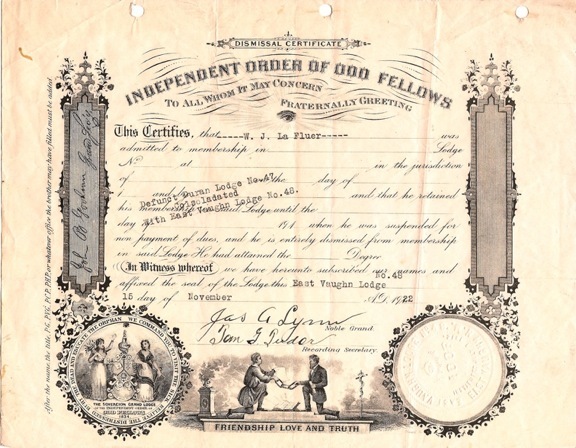 There have been quite a few different Oddfellows groups through history, it was a notably schismatic community through the 19th C, and different obediences probably retained their aprons for different periods of time. I bought this IOOF apron because of its beautiful blue field and the colorful contrasting appliqué band around the border. It is a more unusual style of apron for the Odd Fellows, and if the bullion decorations weren’t as precise as they are, I would suspect that it was home-made, rather than commercial. 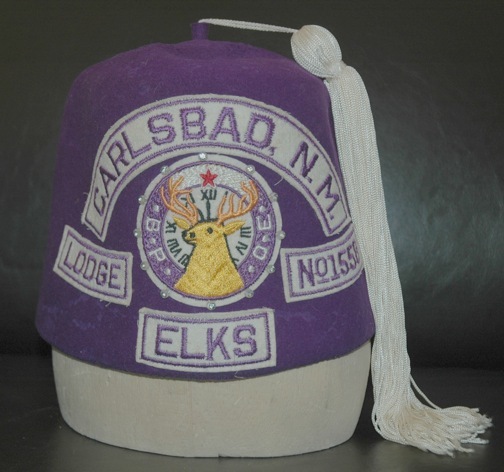 The Benevolent Protective Order of Elks, or more commonly just “the Elks” wore lambskin aprons for the first 30 years or so of their existence as a fraternity, but the apron was the first of the (almost surely Odd Fellow or Freemason-inspired) fraternal “secret society” aspects of their ritual and function to be done away with, around 1895. 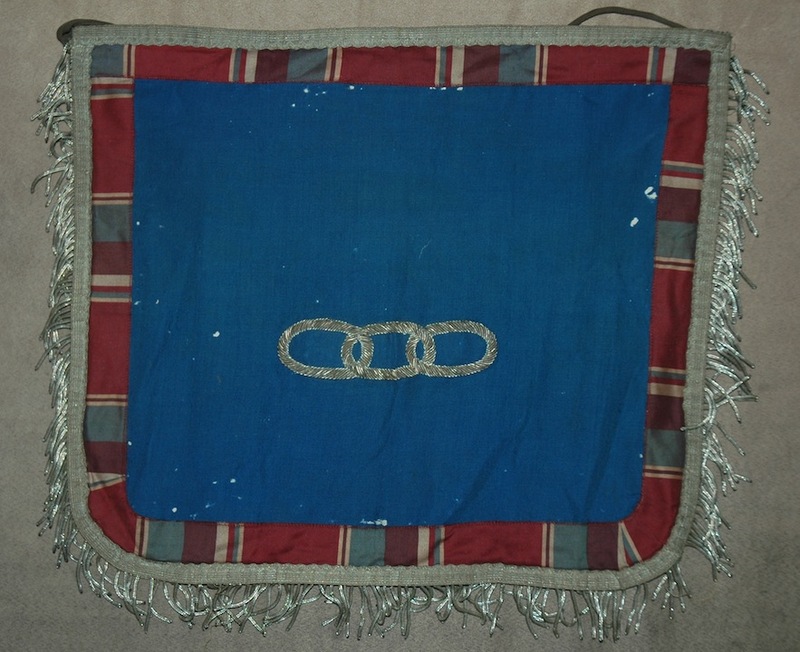 I collected this Masonic apron recently. 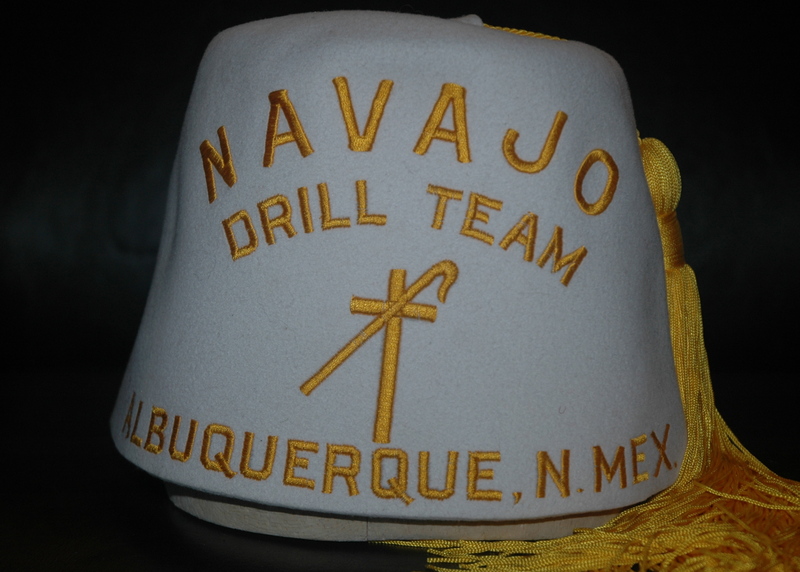 The fact that it is an older piece from a New Mexico Lodge made it very attractive to me, to begin with. 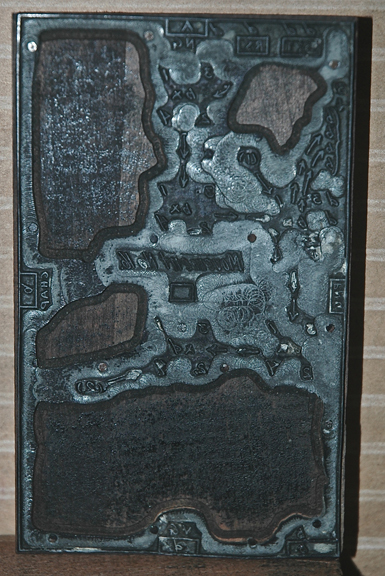 But as I looked more closely at it, at the hand-calligraphed inscription beneath the flap, I knew I had to have it. Because it’s wrong! Well, that gives a skewed impression. The jurisdictional notation of F&AM is incorrect: New Mexico is an “Ancient” state, we are AF&AM Masons. A nerdy detail which of course made this intensely interesting to me. 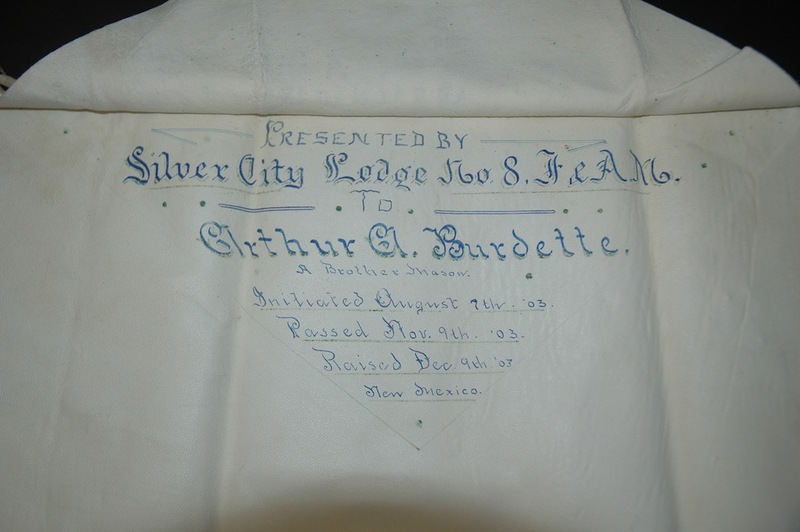 It is either the work of an indifferent calligrapher, or it could be a purposeful jab of sorts, as the Lodge in Silver City actually stood in revolt against the formation of the Grand Lodge of New Mexico in 1877. 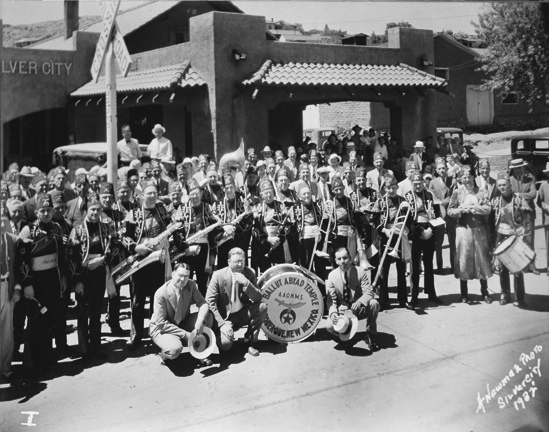 They preferred to unite with the Grand Lodge of Arizona, which would have made them an F&AM Lodge. 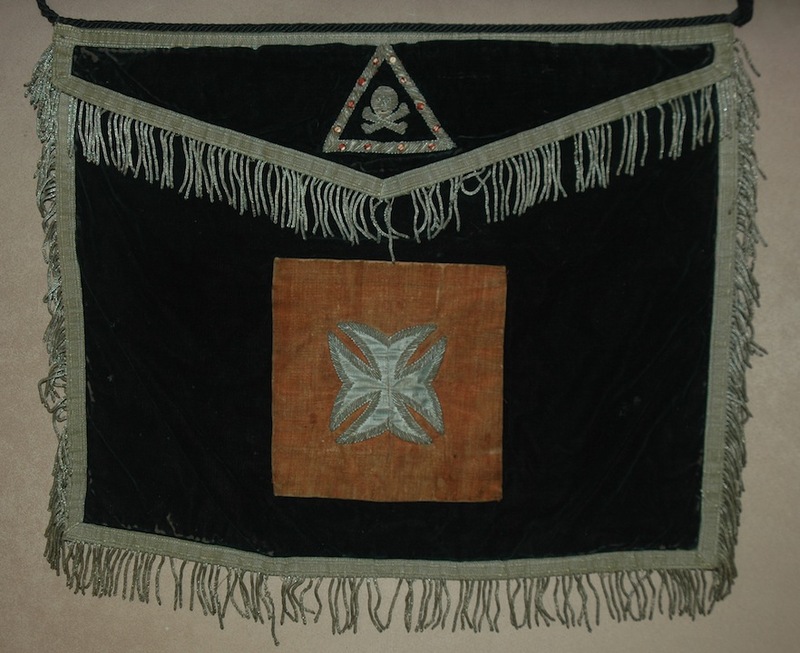 So, in the end, some orders are aping the Masons…by wearing aprons. Others are not. In the case of the Odd Fellows, Gardeners and other much older groups, I would put forth the totally unsubstantiated theory that similarities—especially in the earliest days of what we now consider to be fraternal orders—might have arisen because they were drawing on common source material. References to the Temple of Solomon would have been common throughout intellectual circles in the late 17th and early 18th Centuries. An image like the All-Seeing Eye might well have been ubiquitous in esoteric symbology of the era. (I will remind us that the Seal of the United States is not a Masonic image, and it uses the All-Seeing Eye!) Similarly, such accoutrements as aprons might have been used by an array of orders in those pro to-fraternal days because such garb might have already been in use by the orders and societies that spawned the groups we now lump together as Fraternal. Regardless, they are magnificent billboards, are they not? I’m not only crazy about fraternal collecting and Lodge life, I’m also crazy about my husband, my pets, sci-fi movies, and (another big one) New Mexico. I am a born and bred New Mexico boy, having grown up my whole life in Albuquerque. I’ve travelled all over the world, pretty literally, but I am always glad to get back to my dusty little city. 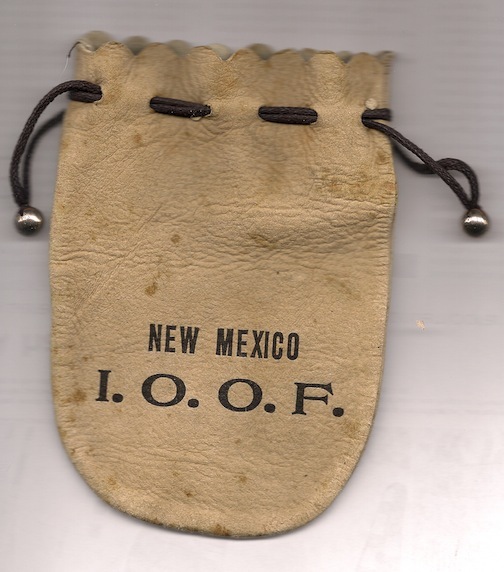 No giant shock, then, that I also have a niche in my collection for objects that originate in New Mexico. Even things that I might not otherwise collect become instant must-haves if they are from my fair state. As a result, I have a small but growing sub-collection of objects that are Local. Mind you, there isn’t a huge amount to go on: fraternalism has never been as big a Thing in New Mexico as it is in other states, even states directly adjacent. Many national organizations have only a token presence here, and some are gone from the state altogether. No longer with us, either, in the Land of Enchanment are the Improved Order of Red Men. 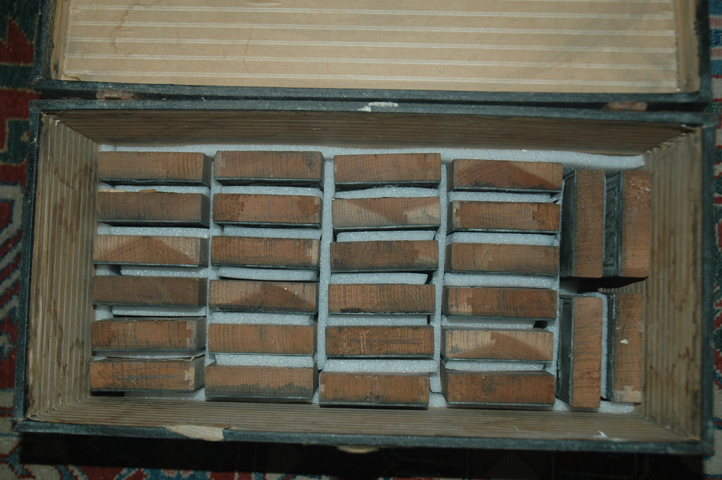 Usually, I wouldn’t collect a photo in such terrible shape as this one, but this ca. 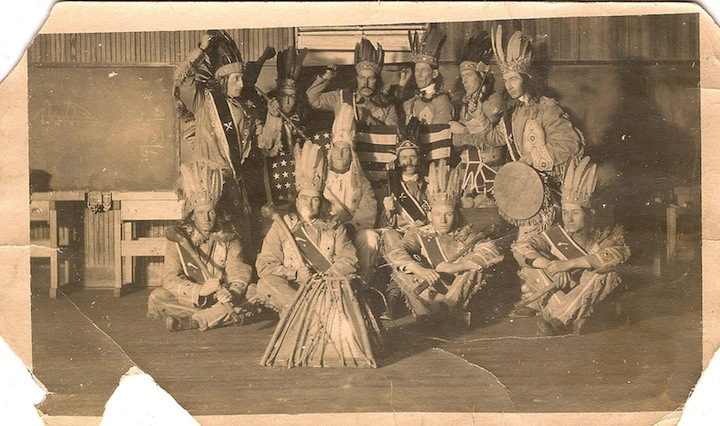 1930 snapshot of Red Men from Hurley, NM was absolutely not to be missed. The interesting details it contains also make it quite worth it. Is that a plug-in campfire? There are Elks here, of course. Not elk…well, yes there are plenty of elk in New Mexico…but Elks. BPOE, that is. I’m uncertain if there are IBPOEW, although down the way, toward the South end of the city, there is a building that appears to be an Elks lodge, but which is not noted on the BPOE website, so I have my suspicions. The Elks are quite big in New Mexico, especially down south. The Carlsbad Lodge is a truly massive organization. I had lunch there once while attending the (Masonic) Grand Lodge Communication being held across the way at a community center. And they’ve been active in New Mexico for decades. Based on the details of this GSP, I date it to the 50s. Odd Fellows continue to grace and enrich our state, I am pleased to say. The IOOF Grand Lodge for New Mexico is actually just around the corner from my own AF&AM Masonic Grand Lodge. The railroad towns of New Mexico—and we have as many as any other place, or we did back when—were heavily IOOF territory. Vaughn, NM these days might not even have a supermarket (I think they do have a grocery), but in the 19-teens it was enough of an iron horse boom town to apparently warrant its own Odd Fellows Lodge, in addition to the one just over the hill in nearby Duran. They consolidated in 1922, as evidenced by this form, which is a beautiful little piece of ephemera. Freemasonry is actually going pretty strong in New Mexico. Our Grand Lodge was organized in 1877, having descended from Ancients in Missouri, which in turn hearken back to the Ancients of North Carolina, by way of Tennessee (who are Moderns now, which is interesting). In addition to our Subordinate Lodges, we have Shrine (AAONMS), OES, Amaranth, White Shrine of Jerusalem, York & Scottish Rites and all of their myraid appendages, Sojourners, and Allied Masonic Degrees. Who knows what I’ve left off there. The only larger bodies, nationally, that we are missing would be Grotto (MOVPER) and Tall Cedars of Lebanon. Not all of our Lodges are growing, or even holding steady. But overall, we are getting younger and younger as a group. The current incoming lot, which includes me I suppose, filling in behind the lost generation, is largely in its 20s and 30s, and many Lodges in New Mexico have (or recently had) Masters in that age range, as well. Chapman #2, Temple #6, and Sandia #72 spring to mind, and I’m sure that there are others. Our sitting Grand Master is only 38! I don’t know for certain, but when I bought this photo it was suggested that this might be a portrait of the Brethren of Gate City Lodge No. 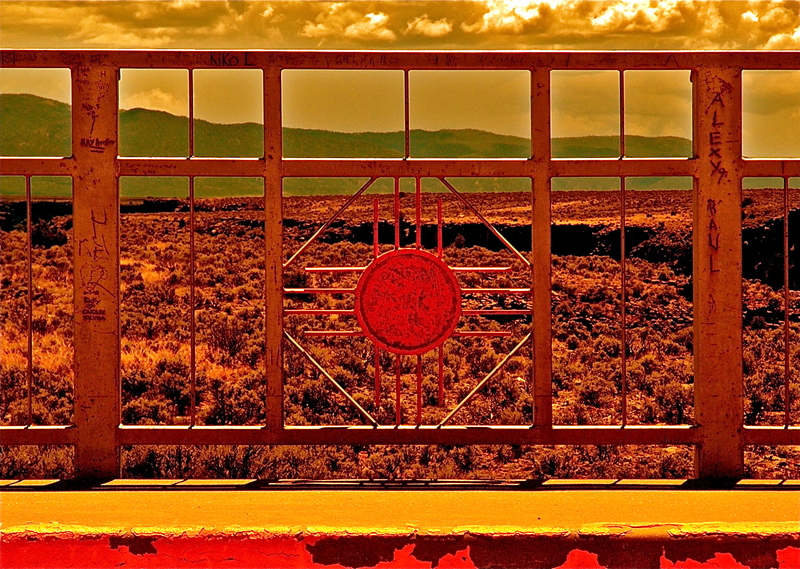 11, in Raton, NM. Who knows. Some day I might manage some research that will confirm such a thing (it would be neat). I tried emailing Gate City years ago and their listed email address was dead. Ho Hum. 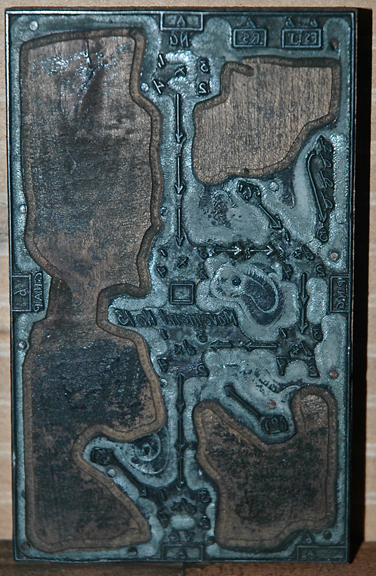 Until then, I’m calling it Gate City 11! The Great Depression might have throttled American fraternalism, but the Shrine never gave up, and always insisted on continued extravagance and display. Here, the Ballut Abyad Band is pictured at the Silver City train station, looking like they are ready to parade. And of course…fezzes. Who are you talking to here? I actually entered these two BA pieces into the State Fair last year, in the Antiques and Collectibles competition. The lady at the registration desk looked at me like I was crazy, and said in a deeply condescending tone, “…fezzes?” (My husband almost slapped her.) But I was not to be deterred. I smiled and chirped right back, “Yes, ma’am! Fezzes!” Shaking her head, still kind of sneering at me, “Well…are they at least…old?” “They’re from the 40s, ma’am.” She kinda raised an eyebrow; she’d had a moment to look at them, and they really are beautiful pieces. She shrugged and made out the tags. The White Shrine of Jerusalem is a Christian body appended to the (Masonic) Knights Templar. There aren’t many of them still around, although I believe they are still currently active in New Mexico. 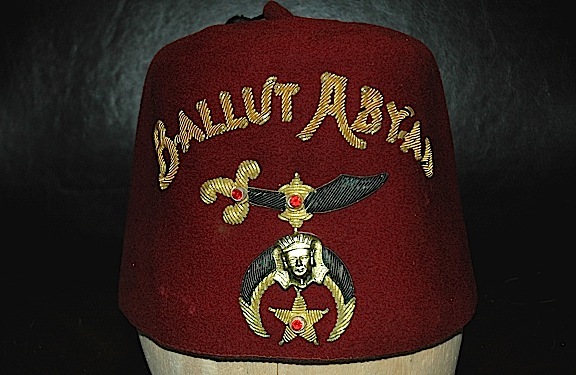 This fez suggests that at some point they were expert paraders. I gotta watch for photos of these ladies.